PC, phone, gesture, voice, even brainwave can be used to control Dobot Magician. The handhold teaching feature lets you control a robotic arm without any limits. The most intuitive interaction bringing the best of your efficiency. Integrated so many features, while making it easier to control a robotic arm. A whole set of parameters for your customization. 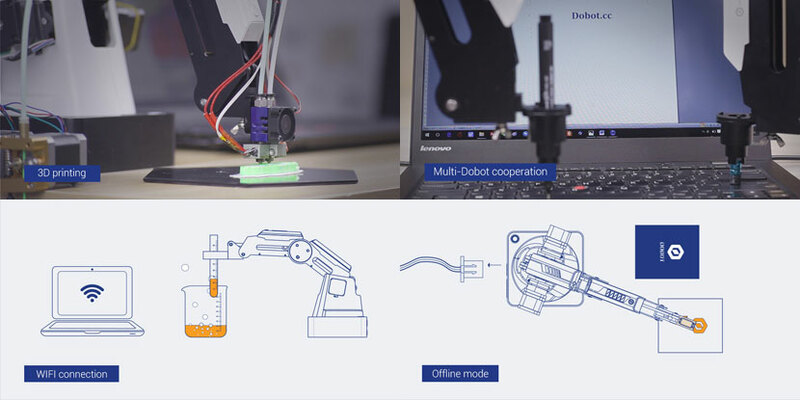 Calibrate your own robotic arm without any coding! Endless potential, fast deployment. Be ahead of the game. 13 extension ports, 1 programmable key, 2MB offline command storage, endless possibilities for developers. Visualized programing interface, just pile up the blocks and there’s the code, the easiest way to learn coding. Support major programing languages including C++, C#, Python and java, with API and pre-set modules integrated.